This summer and fall (2014), I worked on a project to better understand the invasive history of Gracilaria vermiculophylla. G. ver. is an invasive species in the US and Europe, meaning that it spread to these areas from its native region. The invasive history gives us information about where the invasive species came from and how it spread. It is important to learn about a species’ invasive history so that we can have a better understanding of how and why a species spreads. This knowledge can help us to prevent and manage invasive species in the future; especially when these species have negative environmental or economic effects in the regions they invade. I used a molecular marker as a clue to help roughly identify the source region(s) of the non-native populations of G. ver. DNA is made up of sequences of four different nucleotides: A, C, T, and G. The marker we focused on could have either a C or a T. We decided that this marker would be a good clue because there was a correlation between the location from which the sample was collected and which nucleotide (C or T) it would have at the marker. So, if we tested samples from all over the world to see which nucleotide they had at the marker, we thought we might find genetic similarities between native and non-native samples. These similarities could be used to match non-native populations with their native source regions. First, we had to get samples of native and non-native Gracilaria ver. tissue from all around the world. We collected samples from the east coast of the US (South Carolina, Virginia, Delaware, Maryland, and New Jersey) and asked other scientists to send us samples from Europe and Japan. We extracted DNA from each of our samples, and made copies of the DNA using PCR. We used a restriction enzyme to cut the copied DNA segments at a specific point on the copied DNA sequence. 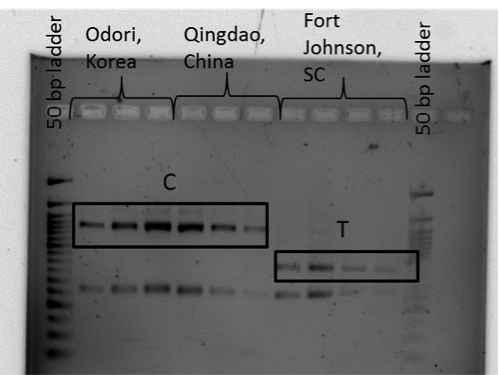 The restriction enzyme would cut if the marker had a T, but not if it had a C.
We found that most of the samples from native regions had C’s, except for samples from northeastern Japan, which had T’s. The vast majority of non-native, invasive samples also had T’s. These data suggest that most non-native populations spread from northeastern Japan, because they are genetically more similar to this region in comparison to other native regions. Next, I’ll be studying G. ver.’s tolerance to different shades of light and to hot and cold temperatures, to find out more about the role that these traits played in helping G. ver. spread to different regions around the world.